If you’re having problems coming up with something to get dear ol’ Dad for Father’s Day, you’re thinking too hard. Save the fancy brunch and searching online for creative gift ideas for your high maintenance family and friends that appreciate (demand) such time and effort. Dad is much easier – especially if your dad happens to be into cars. Does your dad have a “project car” that he’s currently working on out in the garage? Ask him if you can spend the day working on it with him. You never know what you might discover under the hood. If classic cars are your dad’s passion, but he’s not into restoring them himself, is there a classic car museum that has been on his list of places to visit? What better time to check it out than on Father’s Day! Going to the racetrack with your dad can be a lot of fun. Watch others race or find a track that will let you take your own car out for a few laps of adrenaline-pumping fun. Either way, an afternoon of high-speed action can be a great way to spend time together on Father’s Day weekend. A passion for classic big or small-screen favorites can easily be coupled with an afternoon of old-time fun on Father’s Day afternoon. Remember assembling model car kits when you were young? Yes, they still make them. 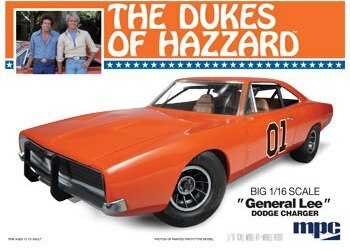 Check out the General Lee or Christine models available on megahobby.com. Right about now you might be thinking, “Great ideas, but they won’t work for me.” If you don’t live near your dad, or if you simply know you must show up on Father’s Day with some kind of gift-in-hand, you’re in luck. There is still plenty of time to get your dad a gift he’ll love at a price that works for you. Is your dad a truck guy? Maybe he loves muscle cars? Or has a pension for Jeep® Wranglers? Ram Outfitter, Dodge Life and Jeep® Gear all have some exceptional gifts for your vehicle-loving dad. From classy cufflinks to wear with his Sunday best to T-shirts and ball caps that keep him stylish on the go, these sites have you covered. So, don’t bother with the brunch reservation at the fancy restaurant downtown. Return the tie. Forget the book. Stop trying to buy him some new cologne. Dad doesn’t need another watch and he still hasn’t used the beer-making kit he got for Christmas.